Unlike the names of Stephen F. Austin or Sam Houston, Joseph H. Polley’s name probably isn’t familiar to the average Texan. Like South Central Texas itself, however, Polley and his family are deeply connected to the state’s early history. Some of those connections relate to Texas’s transition from a Spanish territory to a province of Mexico in 1821; others tie into the state’s push for independence and the Texas Revolution, and some relate to the American Civil War. 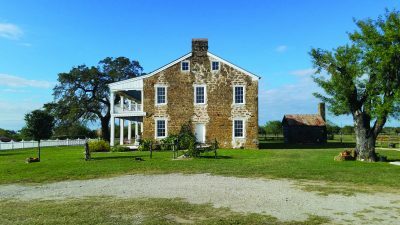 Upon his death in 1869, Joseph Polley left behind a monument of Texas history that endures to this day—a monument located in GVEC’s service territory: The Polley Mansion. A native of Whitehall, New York, Polley first traveled to Texas with Stephen F. Austin’s father, Moses, in 1820 to found a colony of about 300 immigrant families. Upon returning from Texas to his home in Missouri, Moses died unexpectedly and Stephen became overseer of the drive for a colony. In 1821, Polley returned to Texas with the younger Austin, this time settling part of modern Brazoria County. Between 1821 & 1835, Polley married Mary Augusta, became sheriff of the colony and helped shepherd Texans fleeing the Mexican army during the Runaway Scrape migrations of the war for independence. Sometime during 1847, as the Mexican-American War raged, the Polleys moved west with their eight children onto a large tract of land that’s now part of Wilson County in Sutherland Springs. By then, the Polleys possessed the means to build a large mansion. Polley Mansion It would require roughly five years to complete. 1848 saw the birth of a new Polley child—Jonathan James—and the death of another—Emeline Elizabeth, age 17. As so often happened during that era, Emeline died in childbirth; her daughter passed away a year and a half later. To pay remembrance, the Polleys buried Emeline and her baby on their homestead, establishing the Polley family cemetery. That cemetery still stands, having undergone a complete restoration in 2003. It serves as the final resting place of 11 Polley family members, including Mary Augusta and Joseph. Interestingly, although Polley Mansion has long since passed from family ownership, the cemetery has never been sold. Historical records suggest the family probably moved into Polley Mansion sometime in 1854. They immediately filled it with life, love and much joy. In the run-up to the Civil War, between 1851 and 1860, the Polleys hosted numerous well-attended community gatherings, including parties and dances. 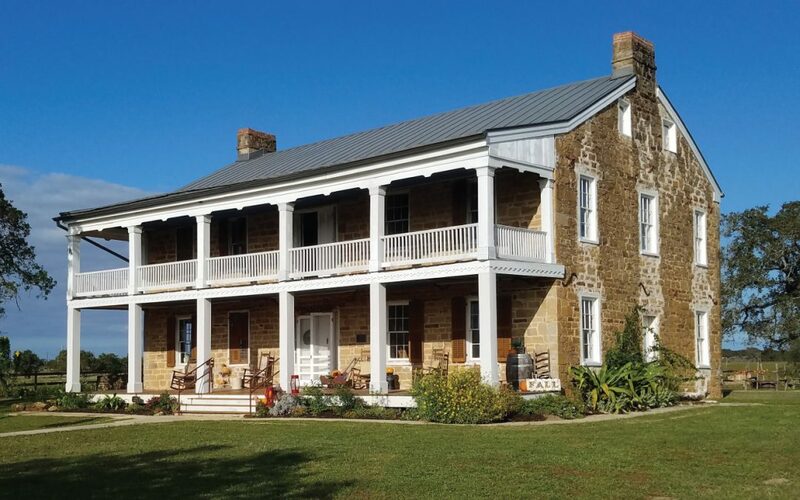 Following Joseph’s death in 1869, Mary opened the family mansion as a boarding house for visitors to Sutherland Springs. She died in 1888, passing the mansion to her sons, who sold it in 1904. Polley Mansion would sell again in 1907, 1917, 1922, 1946, 1990, 1993 and once more in 2015. By the time of this final sale, it had fallen into severe disrepair, but new owners Keith and Robin Muschalek set about restoring it. That renovation has proved a massive undertaking, but for Robin, a retired school teacher, and Keith, a retired army colonel, the Polley Mansion has become a passion. 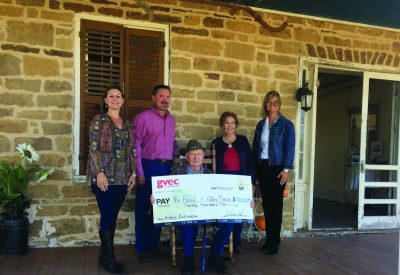 In 2017, the Muschaleks applied for and were awarded a $20,000 GVEC Power Up grant. Those funds helped replace the mansion’s 31 windows, a project completed in February. Although the Muschaleks have also replaced the house’s roof and straightened the kitchen cabin chimney, much work remains, but the couple looks forward to finishing. They’ve already opened the old home to tours and professional photography. “We love sharing it,” Robin said. “And the more we find out about it—the more we dig—the more we’re just blown away.” Neither Robin nor Keith are related to the Polleys—that they know of—but Robin hails from Saratoga Springs, New York, which is only 45 miles south of Joseph’s Polley’s hometown. The couple wasn’t initially aware of this connection and Robin wonders if there could be a familial link somewhere in her lineage after all. To learn more about the Polley House or find out about making a donation, visit www.polleyassociation.org or search Facebook for The Polley Mansion. To tour the home, make a donation or find out about using it for professional photography, call 571.606.3385.